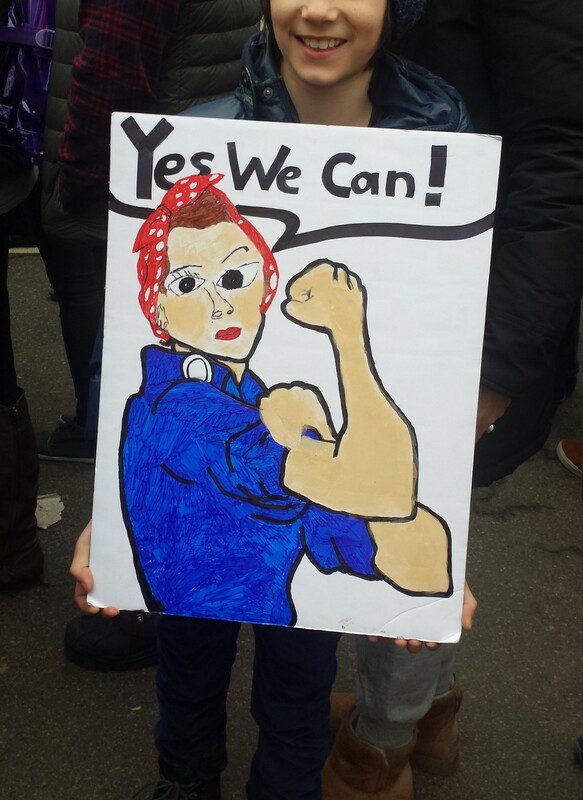 From Rosie the Riveter to Kali to Mother India, how empowerment takes many forms. Shreyas R. Krishnan is a designer and illustrator originally from Chennai, India, whose creative journey has taken her across continents. The stops on this route, sojourns in places like Ahmedabad, Milan, Bangalore, and Baltimore, are woven into what she calls an ever-evolving “personal mythology” that helps to explain the person and artist she has come to be. Krishnan describes her past as a series of culture shocks. However, rather than finding these experiences negative, culture shocks became moments of productive discomfort for her. 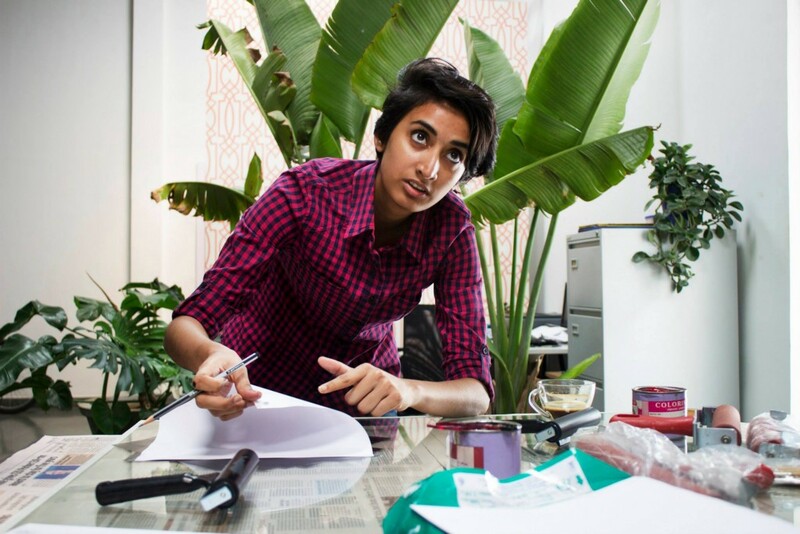 A move from Chennai to Ahmedabad to attend the National Institute of Design (NID) brought her face-to-face with the different lifestyles and cultures of her classmates — many of whom, like her, had come to NID from states and locales she was unfamiliar with. She also had to contend with learning Hindi. Later, she spent a semester at Politecnico di Milano in Milan, Italy enrolled in a course data visualization. In one class, she and her classmates examined indices of poverty, and this experience led her to a new realization. “I had read enough versions of the Ramayana and Mahabharata to know that stories could have multiple lenses and tellings, but being told that poverty was not an absolute one dimensional entity showed me that lenses and tellings apply to real life as well,” she said. It was in Milan that she also began to develop some of the habits that characterize her work to date, like her careful collection of personal experience through diaristic drawing. “I drew and wrote a lot in sketchbooks, as a way to ground myself. 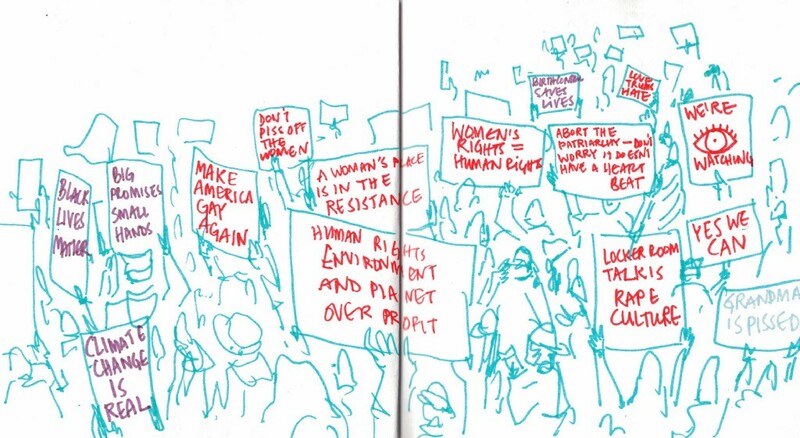 Filling up sketchbooks is a common thing among design students, but it was really the first time that I started using drawing and writing as ways of documenting and processing personal change,” she said. 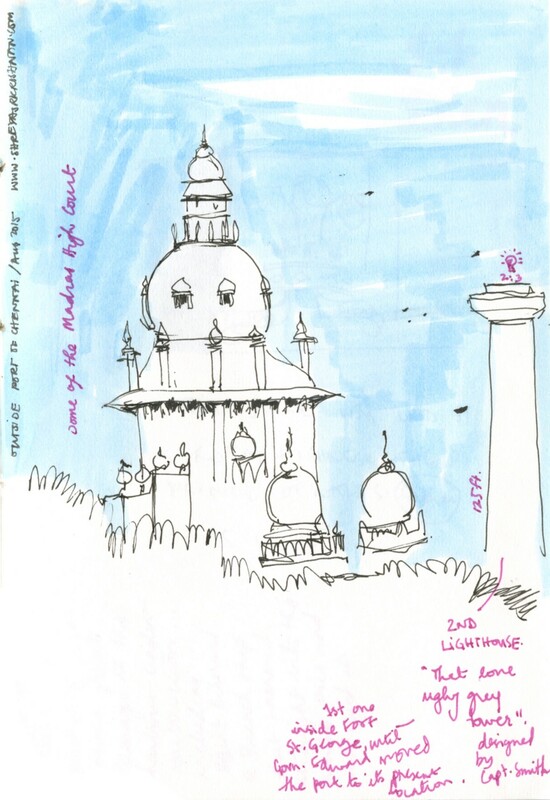 After working in Bangalore at the design firm Trapeze and collaborating with other designers on the critique website Little Design Book — all the while accumulating a sizable repertoire of visual journalistic work — Krishnan enrolled in the MFA Illustration Practice program at Maryland Institute College of Art (MICA), Baltimore. She now teaches illustration at MICA and Towson University. 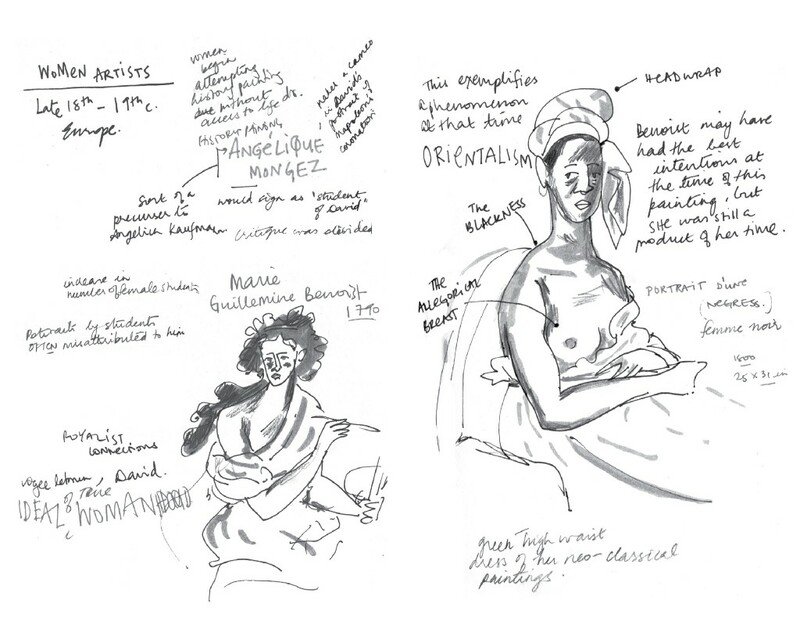 Much of her illustrative work focuses on her self-described interest exploring questions of gender and belonging through a combination of accessible critical writing and drawing. 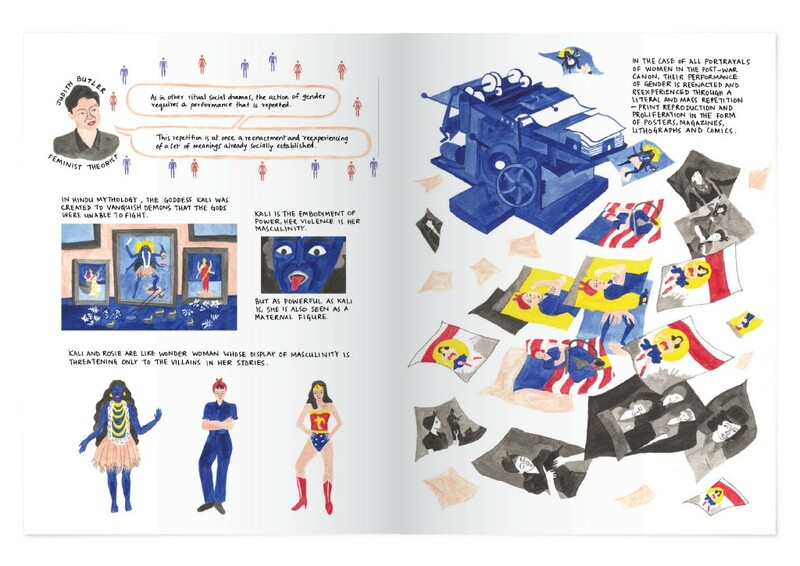 Krishnan’s award-winning comic Becoming Rosie is a piece that combines the concept of gender performativity explained by Judith Butler with a look into the history of the famous image of Rosie the Riveter. In the comic, Rosie is placed in conversation with another subversive feminine icon in the pantheon of Hindu deities, the goddess Kali. A preview of Becoming Rosie is available on Krishnan’s website. 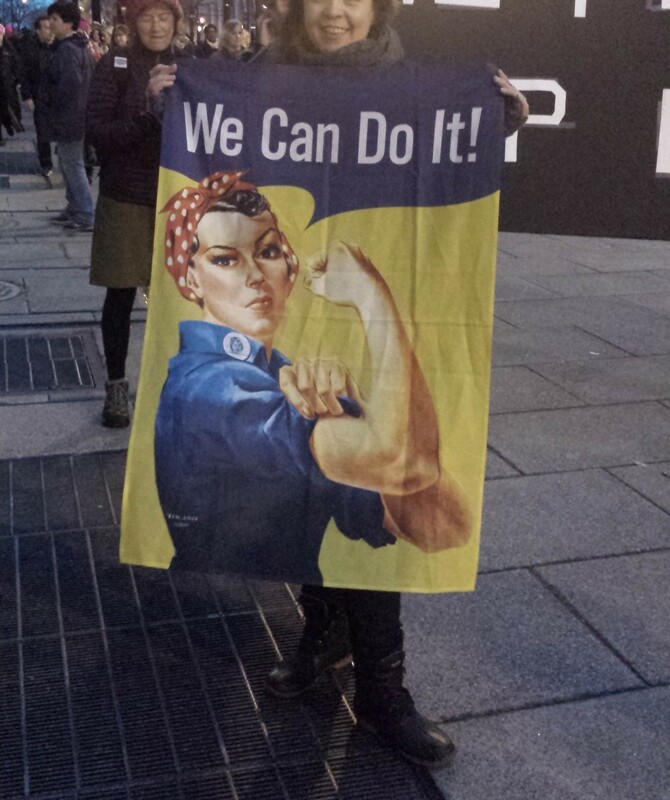 Kajal: In your essay for the Rockwell Center on Rosie the Riveter — which is included in the text of Becoming Rosie — you connect the mass reproduction of images to the entrenchment in public memory of certain cues that signify femininity and masculinity. At the same time, you discuss how images like Rosie can subvert those very cues. You also position the Hindu goddess Kali as analogous to Rosie, given her depiction as a fierce, martial figure, but the first female image that came to my mind as a comparison was actually the figure of Mother India, the essential nationalist image of Indian womanhood. 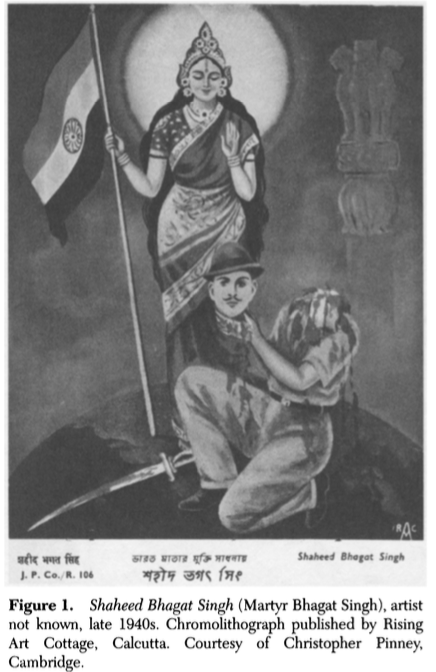 A typical depiction of Mother India, a personification of the Indian homeland and nationalist symbol. Image courtesy of Tasveer Ghar. 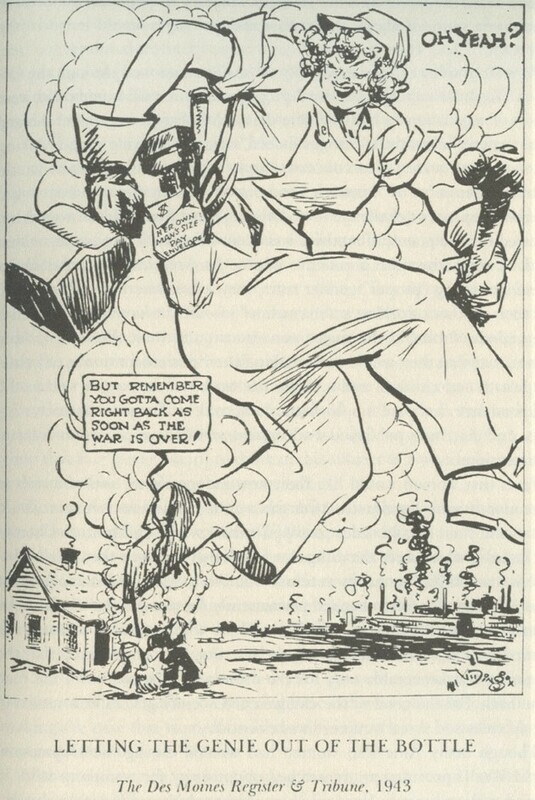 Unlike with Mother India, though, you argue it’s the subversion of gender roles that lends Rosie the ability to be a symbol of female empowerment. However, both images are tightly tied to a nationalist history. Krishnan: Oh I agree, Mother India as an idea has many similar qualities to what I wrote about with Rosie the Riveter and reproduction of images. I made the Rosie-Kali connection in my essay on a visual basis in addition to the idea of reproduction of images. 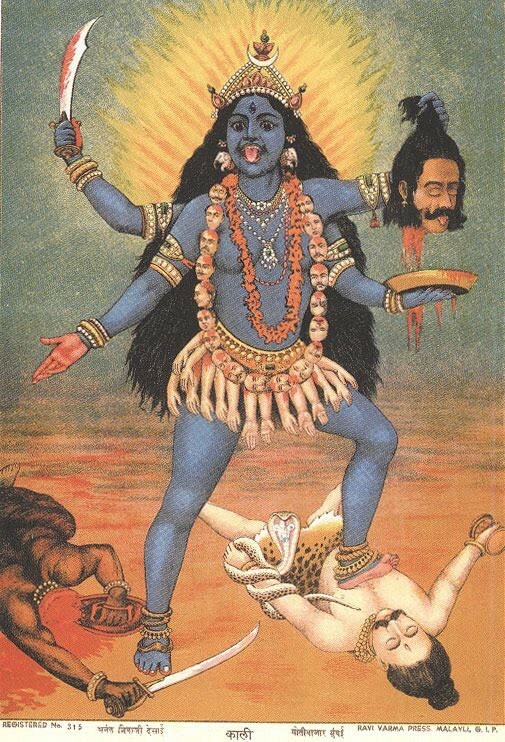 This image of Rosie (dressed to work, holding tools and a lunchbox, towering over a man who is presumably her husband), mirrored Raja Ravi Varma’s Kali standing over the bodies of a beheaded Raktabija, and Shiva, her consort. The similarity of posturing that is usually considered masculine and all the blue, was hard to ignore. A side-by-side comparison of the similarities between the masculinized Rosie and Kali. All three — Rosie, Kali, Mother India — create a new notion or boundary for “acceptable” masculine behaviors or privilege that women could claim, in the absence or inability of a male figure. 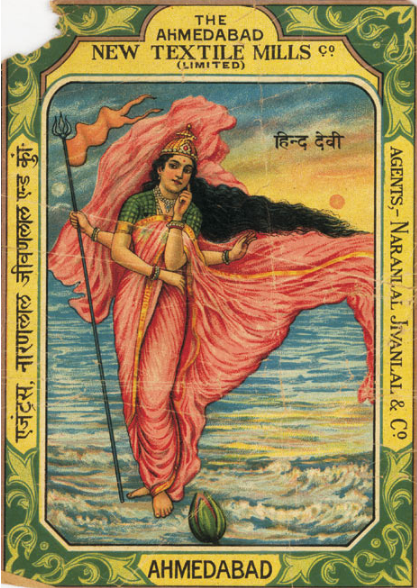 Like Rosie and Kali, Mother India was created to address a specific problem — as a counter to Katherine Mayo’s 1927 book Mother India, which attacked Indian values, nationalism, the place of men and women in its society. Mother India was meant to be the embodiment of the ideal Indian woman, a kind of amplified version of the expectations placed on Indian women anyway: sacrificing, chaste, loyal, hard working, nurturing. Mother india blessing Bhagat Singh. Image courtesy of Sumathi Ramasway. Ramaswamy also unearths from the archive these weirdly morbid Mother India images which draw upon similar visual motifs that you cite in Becoming Rosie, and its accompanying essay, regarding Kali. In this image, she towers above a figure of a martyred patriot, and the whole impression is quite gruesome and violent. The intent, though, is to cement the idea of nation as a thing to sacrifice oneself for than to portray Mother India herself as a powerful, autonomous figure. This image is really interesting to compare with the one of Kali. Both feature decapitated heads, but who is shown doing it also shifts meanings completely. Kali is actively engaged in the decapitation, while Bharat Mata is enabling it. Which one is performing as more masculine? Which one seems to have more power? Rosie and Kali are also ideas that live in multiple representations — the image of Rosie and Kali I referred to in my essay are not their only depictions, but instead use established visual cues to allow any viewer in the know to make that connection. With Mother India, she is trapped in that single visual icon — red sari, plough, the pain of labor and sacrifice on her face [made famous by the 1957 eponymous film]. She is an idea, yes, but an idea that is one amongst many individual depictions of Mother India (or woman as Indian nation), not an entity that encompasses all visual instances. Maybe that’s one of the reasons Mother India can never be isolated from nationalist and patriarchal connotations. I’d previously made Stuck in the Middle, a one page comic using Mother India to talk about the simultaneous objectification and deifying of women in visual media (Indian cinema, specifically). Can Rosie truly be a subversive icon of female empowerment, as you intimate, since she is ultimately tied to notions of patriotism and nationalism, like Mother India has been? 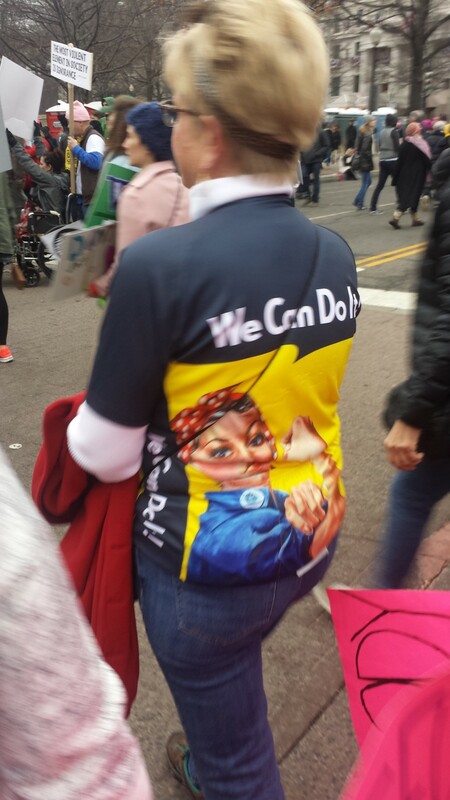 I don’t think the image we now associate with Rosie the Riveter (the J Howard Miller ‘We Can Do It!’ poster) has as much nationalism implied in it today as it did before. Partly because the image itself has been appropriated and subverted so many times, pulling it away from its original context, from being a white woman to so many other identities, that the red and blue that doubles as workers’ clothes and an American flag stops being as significant — the form of the person being shown flexing becomes more important. The flexing itself is the claim for power. There’s so much mashing of this image with other pop culture references that it’s started to take on a whole new identity. 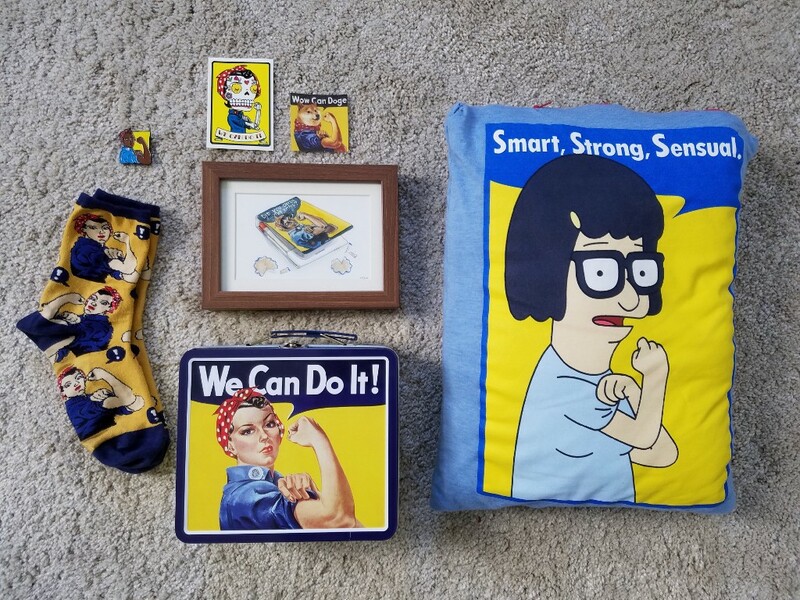 (This one of Tina Belcher from Bob’s Burgers, and this one of Doge are two of my favorite recent pop culture references of the We Can Do It! poster). Empowerment comes in different shapes and forms — sometimes it is having visibility (for example, recognizing work by women), sometimes it being invisible (not being subjected to a gaze). While subverting gender performance at an appearance level is crucial at times to validating an identity or existence, at times it can also cross over into appropriation. What does Rosie mean to you personally? How do you carry her with you day to day? Rosie is a constant reminder of the power of visual culture in shaping collective thought. It’s a fairly broad statement to make, but it has made me much more aware and conscious about watching out for representation, and how certain bodies are shown in visuals. On a literal level, ever since I made Becoming Rosie, I have been gifted a lot of Rosie the Riveter objects. Each one reiterates the extent to which the original unnamed woman on a poster has become solidified as a woman called Rosie. Is there one morsel of truth-telling or knowledge about gender and art, that you’ve tried to pass along to your students? Are there any texts that you feel have most impacted your visual practice that are worth sharing? My first most impactful immersion into taking something from visual culture and unravelling its origins and implications. I heard this talk when I was beginning my undergraduate thesis, and it really solidified my approach to considering narratives in my practice first as a designer, and now as an illustrator and educator. These three books were my permission granters, the ones that made me feel more comfortable and assured about the way I drew, my nature of being a documenter, and the kind of narratives I wanted to work with. I discovered Pollock while writing a paper for an elective called Women in the History of Art. She writes about and art art history through a feminist/gender lens. I use Chimamanda Adichie’s TED Talk The Danger of the Single Story as a way to open discussion about the relation between power and the ability to tell stories. History is not absolute, it is pieced together and constructed by someone. “Past” isn’t a finite amount of time, it grows in size each day with what people record, document and narrate of places, cultures and each other. As narrators (illustrators or otherwise) we have a responsibility to be aware and conscious of the pieces that we contribute.